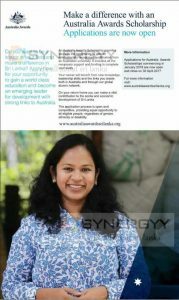 Do you want to be a leader in your field and make a difference in Sri Lanka? Apply now for your opportunity to gain a world class education and become an emerging leader for development with strong links to Australia. Your career will benefit from new Knowledge, leadership skills and the links you create both in Australia and through our global alumni notwork. On your return home you can make a vital contribution to the social and economic development of Sri Lanka. The application process is open and competitive providing equal opportunity to all eligible people. Regardless of gender, ethnicity or disability.